In a world in which the threat of a cyber-attack is almost constant, Israel is already a world-leader in cyber-defense technologies, and a new investment program allocating 90 million shekels ($24.4 million) is aiming to do more than just maintain the status quo. It’s specifically targeted to help “groundbreaking” research and development and pilot programs to benefit technologies “with ‘gamechanger’ potential” according to an Israeli government press release. The three-year funding program—which offers to fund almost two-thirds of R&D costs for certain projects up to 5 million shekels ($1.36 million)—is a joint effort of the Israel Innovation Authority (IAA), the Israeli Ministry of Economy and Industry, and the National Cyber Directorate. “The Authority stresses the importance of groundbreaking cyber defense technologies to preserve Israel’s unparalleled prowess in the field,” Chief Scientist, Ministry of Economy and Industry, and Chairman of the Israel Innovation Authority, Dr. Ami Appelbaum said in the press release. In a world where a new credit card company or healthcare entity has its information breached or its website hacked on a regular basis, staying ahead of the criminal cyber-actors is key. It also has the potential to be profitable. CEO of the Israel Innovation Authority Aharon Aharon was quoted saying that part of the program will also be to assist companies in growing and reaching deeper into the global cyber market. In other words, the goal is also economic, not just innovation. The program will also provide resources to CyberSpark, an Israel Cyber Innovation Arena in the Israeli city of Beersheba. “This program expresses the government’s ongoing commitment to preserving and strengthening Israel’s global cyber leadership, one of the most significant engines of the hi-tech industry’s growth. 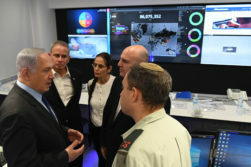 The program is dedicated to addressing the cyber industry’s unique challenges, with an eye towards the future,” said Director General of the Israel National Cyber Directorate Yigal Unna in the press release.